Have you ever seen the plus / minus button that hides or displays rows or columns? How to create it? Let’s see. Select all columns you want to group and go to the menu Data >> Group. That’s all J The hide button will be displayed next to the last column above. It’s the same as columns. So select all rows you want to group and go to the menu Data >> Group. Excel can create all groups in one step. It is based on the formulas in the worksheet. You don’t need to select any table. Go to the menu Data >> Group >> Auto Outline. It’s simple. Select columns or rows you want to ungroup and go to the menu Data >> Ungroup. Automatic ungroup of all columns and rows is on Data >> Ungroup >> Clear Outline. 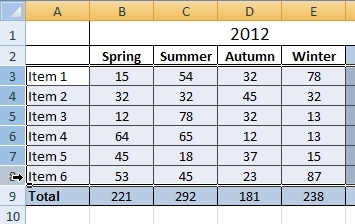 The example shows how to create and delete groups of columns and rows. And how to do it automatically when the table contains the formula. How to hide column in Excel? Nice solution. I had this issue: how to show hidden column or row? Where is the column visibility in Excel?